Welcome to the Florence Veterans Park! This park has been dedicated to the men and women who have served this country in the Armed Forces: Army, Navy, Marines, Coast Guard and Air Force. At the posted coordinates you will find a piece of the Pentagon that has been erected as a special tribute to the victims of the Terrorist Attacks of September 11th 2001. Take a moment to think about the gravity of the monument that stands in front of you before turning your attention to its geologic history. As a reminder this is an Earthcache and there is no container here to sign, rather you must email me the answers to the questions posted below in order to earn your find. 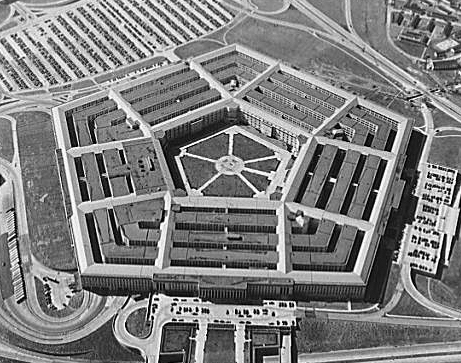 About the History: The pentagon was built in 1941 in an attempt to consolidate the War Department which, at the time, was dispersed over 17 building throughout the capitol. In an ironic twist of fate, the ground was broken to commence building on the 11th of September, 1941. In an effort to conserve steel for more urgent war efforts (think battleships and aircrafts), the War Department turned to one of the most classic building sources in the country: Indiana Limestone. Indiana Limestone has a long history and buildings made out of this material can be found in each of the 50 states. Famous facades with this building material include the Metropolitan Muesum of Art, The Empire State Building, Grand Central Station, San Francisco City Hall, and the Dallas Muesum of Fine Arts. About the Source: The Salem Formation (a.k.a. Indiana Limestone) crops out along a thin, irregular arcuate band in south-central Indiana (Monroe and Lawrence counties). 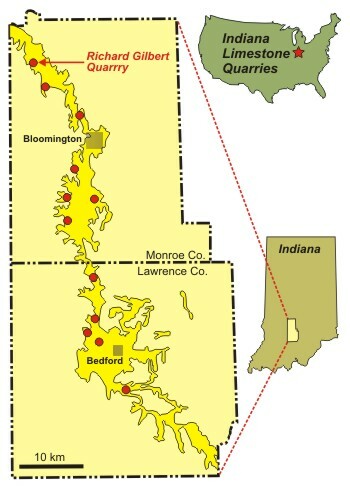 Most quarries lie between the cities of Bloomington and Bedford. Quarrying of Indiana Limestone began in 1827 with the opening of the Richard Gilbert Quarry. The quarried stone was produced for local use only prior to the building of railways in the 1850's. However, by 1900, Indiana limestone represented 1/3 of the total U.S. dimension limestone industry, and increased to 80% by 1920. There are currently 9 active quarries that produce 76,000 cubic meters of Indiana Limestone each year. The limestone is soft and easily worked when quarried, but once the quarried rock dries it becomes case-hardened, that is, its surface becomes harder and more resistant to weathering. Indiana Limestone is a freestone, which means that it has no preferential direction of splitting. It can be planed, turned on a lathe, sawed, and hand worked, making it highly versatile. Where quarried, the Salem Formation varies from 8 to 18 meters (25 to 60 feet) in thickness, and is unusually massive (i.e., lacks partings and stylolites). For a rock, the Indiana Limestone is chemically pure and consistent, being composed of >97% calcite. The combination of these physical and chemical characteristics make the Indiana Limestone well-suited to building because it is more durable than a typical limestone, it can be cut into very large blocks, and it can hold fine detail when carved. As a whole Limestone is relatively light with a density of only 169 lbs/ft3. marine single-celled protists with shells that are commonly divided into chambers which are added during growth. Endorytha appears as small, simple, smooth, ellipsoidal grains. The complex, chambered structure of its shell (or test) is apparent only under the microscope. 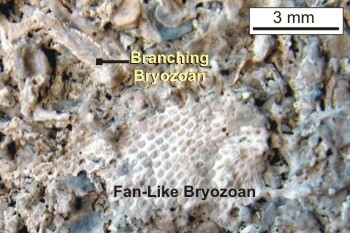 Fragments of bryozoan are also common in the Salem Formation. Bryozoans are tiny aquatic organisms (rarely larger than a millimeter) that live in colonies of interconnected individuals. Some bryozoans encrust hard surfaces such as rocks or shells. Other bryozoans formed tree-like branching colonies. The most abundant bryozoans in the Indiana Limestone formed fan-like colonies that left behind lacy, net-textures fossils. Each window-like hole in the net once housed an individual bryozoan animal. "Fenestra" is latin for "window", and so this type of organism is refered to as a fenestrate bryozoan. Other fossils grains that can be found commonly in the Indiana Limestone include: small gastropods, disarticulated disc-shaped ossicles from the stems of crinoids, pelecypods (scallops) with radiating ridges on their shells, and brachiopods. 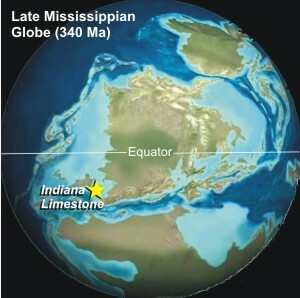 About the Environment In Which it Formed: During the Middle to Late Missisippian (335-340 million years ago), most of what is now the USA was covered by shallow seas that straddled the equator. Limestone accumulated on the seafloor below these warm, tropical waters. The Indiana Limestone formed far enough offshore that very little continentally-derived siliciclastic sediment was available to mix with the carbonate sediment that was forming in the immediate area. Despite being 10's to 100's of kilometers offshore, the water was shallow enough for waves to move coarse carbonate sand across the seafloor. The constant wave action washed away the smallest particles, whereas the larger fossils were battered and broken. The result was a rock consisting of well sorted grains that consist of small fossils and fossil fragments. Like modern-day fan corals, fan-like fenestrate bryozoans lived in quiet, low energy environments. Thus the abundant fragments of these fossils must have been transported from their original setting, but could not have been moved too far or else these delicate fossil fragments would have been completely destroyed. How to Log this Earthcache! As you contemplate the answers to this earthcache recall the long and storied history this piece of limestone has seen: from its formation 335 to 340 million years ago, to being shipped to Washington DC in 1941 to suffering a catacalysmic attack in 2001 to standing guard here in 2011. Estimate the size of the limestone block. What is its length, width and height in feet? Using your answers from the first question, calculate the weight of the block given the density in the lesson. What color is the stone? What element is the likely source of this coloration? “A History of the Pentagon Building.” NPR, NPR, 8 July 2007, www.npr.org/templates/story/story.php?storyId=11817357. Powell, Wayne G. “Indiana Limestone.” Academic Brooklyn, CUNY, 2004, academic.brooklyn.cuny.edu/geology/powell/613webpage/NYCbuilding/IndianaLimestone/IndianaLimestone.htm. “Limestone Density.” Aqua Calc, Aqua Calc, 2018, www.aqua-calc.com/page/density-table/substance/limestone. Rirelguvat lbh arrq gb nafjre gur dhrfgvbaf pna or sbhaq ng gur fprar be va gur qrfpevcgvba ba gur pnpur cntr!